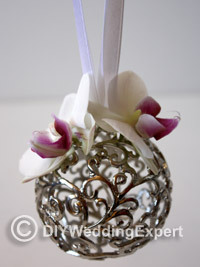 Use this very easy DIY wedding pomander ball tutorial to make your own flower girl wedding accessory. Pomander balls (also called kissing balls) have become an increasingly popular wedding accessory for young bridesmaids and flower girls. I think they are so popular because they are easy for a young child to hold and inexpensive. A length of satin ribbon in a colour of your choice, I used a 50cm length of white 2cm wide satin ribbon. 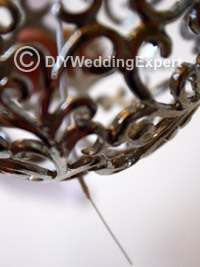 A decorative ball, mine was a silver Christmas decoration, but any type of ball would do that fits in with your theme. A handful of silver floristry wires in a fine gauge. A reel of white stem tape. 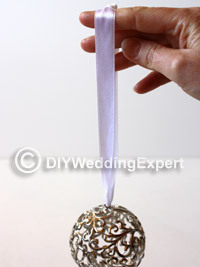 Attach your satin ribbon to a length that suits the person that’s going to be holding it i.e. not too long for a young child. Take a phalaenopsis orchid flower with a stem approx. 2cm long. 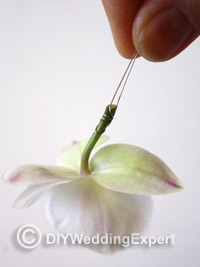 Hold the flower at the base of the stem and twist the wire down the stem. The flower head needs to be securely attached to the wire. Do the same with the other orchid flower. Take the white stem tape (I’ve chosen to use white instead of green so that you don’t see it so much inside the silver ball). 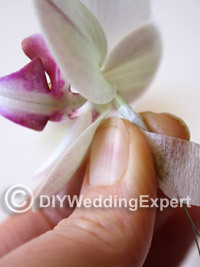 Start at the base of the flower and pull and twist the tape down the length of the wire. All of the wire should be completely covered with tape. Do the same to the other flower. Take hold of your ball and push your wired orchid through the ball. 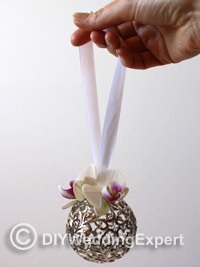 I suggest placing your flowers near to the satin ribbon handle so that the flowers sit on the top of the ball. Secure the wire around the base of the ball. 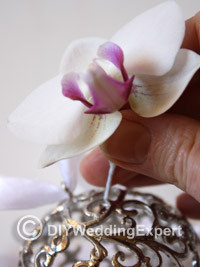 Place the other orchid head on the other side of the ball so that the weight is equally distributed and the ball hangs evenly. 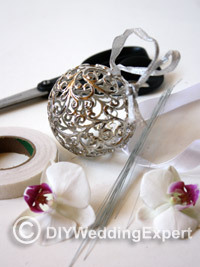 That’s it, an easy DIY wedding pomander ball that’s so effective. You need so few flowers that this is also a very inexpensive flower girl accessory.